Really curious to learn more about our company? You can read below to find some articles we're featured in that help tell our story! "The Big Spoon Creamery keeps their ingredients simple, and they keep their focus simple, too: people and ice cream. Making the best ice cream and delivering it with the best possible service is what they do." 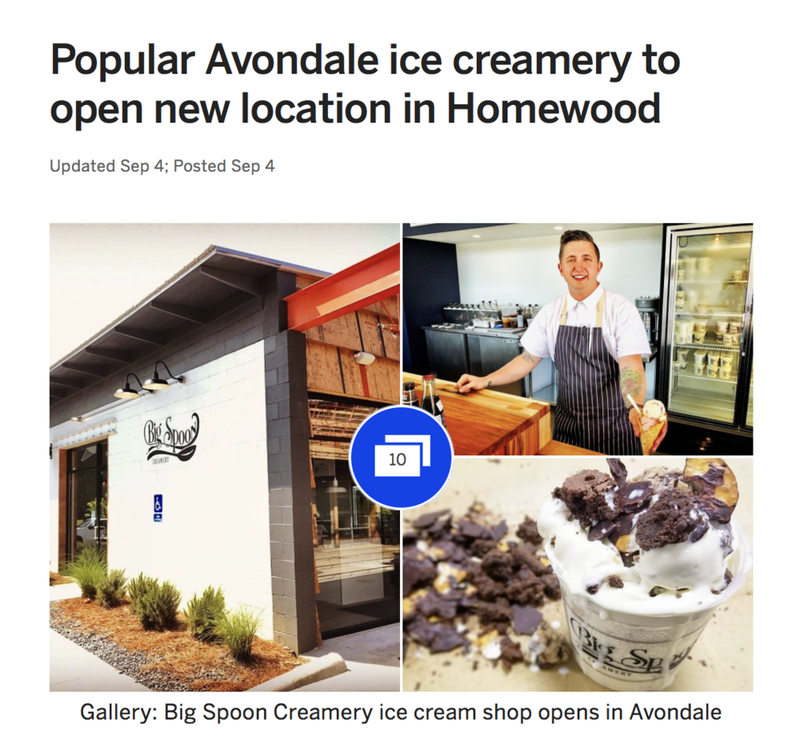 "Since starting Big Spoon in 2014, we've always known we wanted to have a location in Homewood," said Ryan O'Hara, owner/founder. "We're thrilled to be joining a stellar lineup of great restaurants in the Edgewood area and can't wait to serve this vibrant community from our new location." "Their rapid expansion from humble beginnings earned the O’Haras and Big Spoon Creamery the title of Alabama’s 2017 Gee Emerging Retailer of the Year.."
"When we started (Big Spoon Creamery) in 2014 with our trike, our thought process all along was to start small and build," Ryan O'Hara said in an interview with AL.com. "Start with a cart, grow it, and eventually get to a truck and then a storefront. Things have escalated and happened a lot faster than we anticipated." "Although our skyline may not be filled with cranes like Nashville and our downtown streets not as congested as Charleston's, that doesn’t mean it’s quiet around Birmingham. From a global-flavored food hall to restored historic high rises and a cocktail lounge with a mid-century living room in the front, the ‘Ham has been subtly changing its status from pit stop to destination with tourists, and predictable to progressive with locals. As residents of the city Southern Living calls home, our staffers have had the catbird seat for the transformation. Here’s how I take in the best of new and old in the Magic City on the weekend."